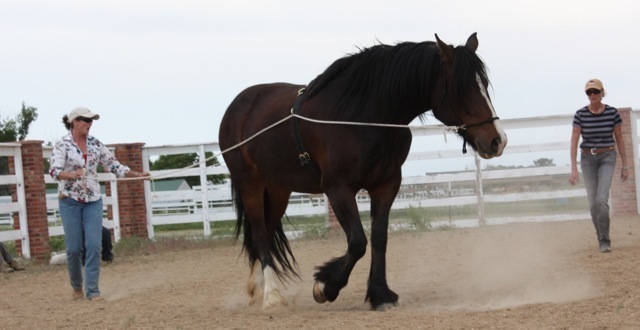 The Mindful Horsemanship program is designed for the individual who wishes to evolve their connectivity with Horse through multi-levels of self-awareness, intuitive awareness of the horses’ communication, refined communication skills and the ability to make clear choices that honor the Horse. Our thoughts and feelings have a great influence with those with whom we wish to partner. Horses are highly tuned to and astute at understanding these nuances of communication, and respond to them. Unfortunately most clinics fail to address this important aspect, creating a missing link between horse and human. This missing link is what creates the connectivity that we seek. When a human explores the layers of consciousness that create their personal space and energy, and becomes more mindful and intentional in creating an open and expansive field of possibility in conjunction with the “how to,” so much more becomes possible with horse. Emotions are energy. Yet, we don’t want to spend all day processing what we often call “negative emotions” just to have quality time with our equine friends. We all have choice about what we will think and feel. Developing the ability to be more mindful of what we are thinking, and how those thoughts produce results in our partnerships, empowers us to choose the thoughts that support the partnership. What might be possible with Horse when the critical mind shifts and softens to curiosity, neutrality and appreciation? High emphasis on the development of “feel” to develop your relationship with horse. Exploration of using the energy field/bubble and body language/posture in communication with Horse. A clear communication process and foundation for creating connectivity with your horse. 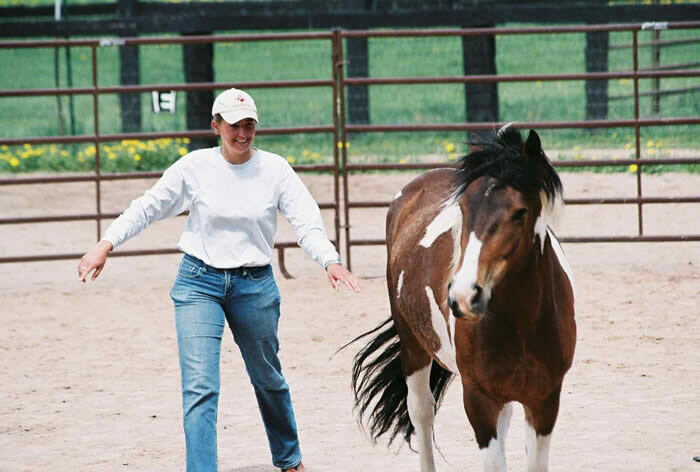 Experience one of Kathy’s master teaching horses in hand 75% of the program. Exploring herd dynamics and finding your position within the herd. Leading from the front, behind and side and what those positions mean to your horse. Playing in the “Field of Opportunity” and exploring the metaphors Horse offers you. Exploring relationships with a young filly, mustang, lead mare and the elders of the herd. The powerful and fun process of line driving. Playing and dancing at liberty with horse. Ultimately we are all looking for a sense of belonging and connection. Horses also seek to fill this need. We also seek a level of communication that is beyond the average and moves into a higher dimension. Whether you would like to . . .
… this program will offer you the theory, insights, and steps to create this mindful dance of connectivity and flow. Horses are available for those individuals attending the clinics at Kathy’s Moon Shadow Ranch in Berthoud, Colorado. You will spend a great portion of the day with a horse in hand learning, creating connectivity, and experiencing the magic in the horse’s heart field. Click Here for upcoming Mindful Horsemanship Programs. Contact Kathy directly for a Mindful Horsemanship Private Intensive. Private Intensives start at $800 per day and may be booked for up to three days in length. “Working with a yearling brought back many memories of when I had my own filly as a youth, and the difference of methodology was dramatic. The technics I witnessed as a child were to power-over and dominate the horse into submission. Kathy’s program, however, mindfully slows everything down creating a solid foundation of trust and mutual respect between horse and human. Kathy modeled dancing in relationship with horse highlighting the power of our energy centers and body positions to “open the door” or stop the flow. This provided me with an internal mental model I could pull from when I stepped in to dance. Learning how to listen to and read both my own and the horses’ body energy was vital. When I brought the energy up to a lope, Kathy coached me to notice where I was in my body; I was light-headed, filled with delight and joy, and a bit dizzy. "Kathy's horsemanship training is a completely different! 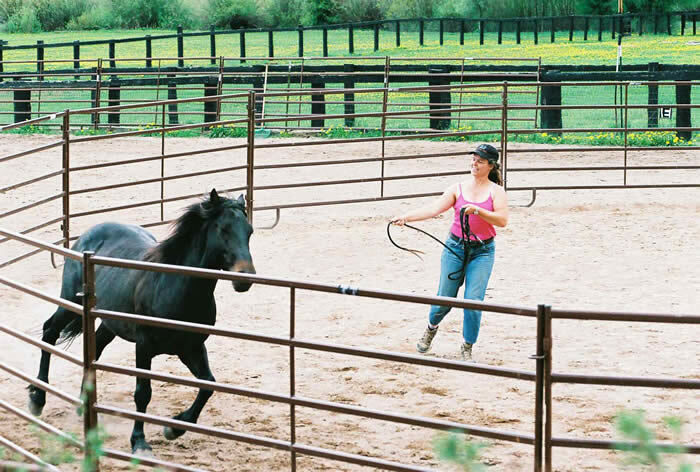 What she taught us was far more than the basic skills: it was all about connection, respect, working with intention, body, energy, ... fully integrating your Mind Body Method while playing with horses. It was an incredible experience, in total alignment with what she teaches in the EFLC. This training is a must! I brought these new tools back home. Playing with what we learned completely changed the way I interact with my horses...so easy, so clear, so connected ...they love it. Thank you Kathy for taking us with you on this journey!" "The single day of Mindful Horsemanship was a powerful gift in understanding more fully the language and practices of Equus. It gave me hands-on learning with tools and practices to use with clients. The day was a lot like being handed a secret decoder ring to understanding the connection between horse and human." Learn more about the power of working with horses, also called Equine Facilitated Learning, in this exclusive audio interview with founder, Kathy Pike. Enter your name & email to receive an immediate download as well as Kathy's newsletter.